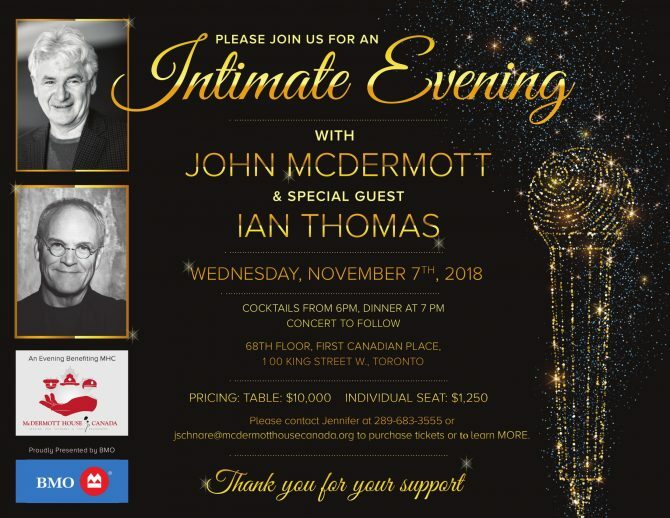 We are proud to announce that McDermott House Canada has partnered with BMO Financial Group to present the 5th Annual: An Intimate Evening with John McDermott! The fundraising Gala Dinner has raised over $500,000 in the past four years. John’s vision for McDermott House Canada has been to create a warm home-like environment to set the standard for premier end-of-life care in Canada for veterans, military, first responders and community patients. We are currently completing the enhancement and expansion of the Palliative Care Unit in the Veterans Center at Sunnybrook. Through this annual event, co-hosted by BMO Financial Group, McDermott House Canada has been able to ensure peace and dignity at end-of-life for those who have served our country. An Intimate Evening with John McDermott promises to be a memorable affair with a spectacular meal and a concert by John who will be joined by special guest Ian Thomas. The event will be held on November 7, 2018 at First Canadian Place (100 King St. W, Toronto) – Individual tickets are available at $1,250 and tables for 8 are available at $10,000. For more information please contact Jennifer Schnare at jschanre@mcdermotthousecanada.org or call 289-683-3555.